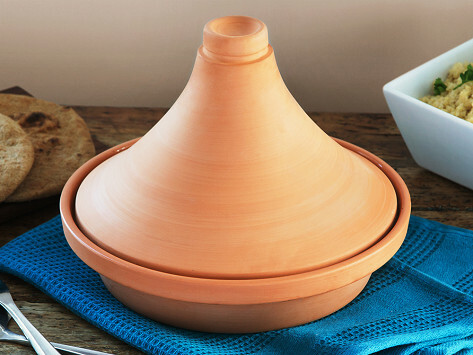 The conical design of this tagine pot isn’t just decorative—it creates the moisture-perfect environment for braising, preparing vegetables, and making sauces. Besides infusing food with flavor, this method of cooking helps preserve nutrients, too. And the vessel goes from oven to tabletop seamlessly. Dimensions: 7.87" x 10.63" x 10.63"
This is a gift for my husband for Christmas. He loves to cook and has been wanting one of these for a few years. We've only used one recipe so far, but it was delicious! Can't wait to try more ! My husband bought me one of these for Christmas a few weeks ago. Now that I've used it for the first time, I can officially declare it my favorite gift that I received for the holidays! It's so easy to use, just follow the care instructions. The inside of the bottom dish is glazed, so you don't have to season it like you might a totally unglazed terracotta tagine. 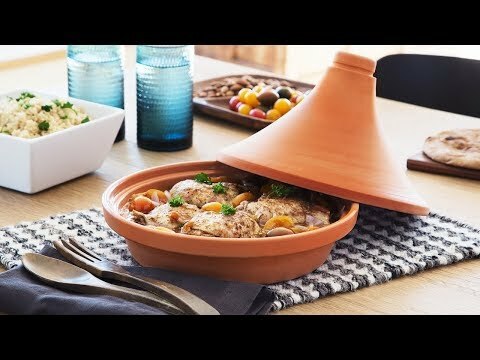 It comes with two recipes (one chicken, one vegetable), and I recommend using one of them for your first use of the tagine, just to get a feel for how it works. The chicken recipe didn't specify an oven temp, so I used 325F as a safe bet (never go higher than 350F). As for the end result of my first effort? It produced a super delicious, incredibly flavorful chicken dish that both my husband and I loved! I had gotten bored with cooking. I have ordered some spices and a cookbook to get started. The company that makes these ceramic cookers traces its lineage back to the 1800s. Since then, they have moved their manufacturing from England to Portugal, but remain true to their timeless ceramic designs.